Vanilla is one of those ingredients that seems to always be called for in the majority of baking recipes. Sometimes it called for different types of Vanilla, ones which you may have never heard of. 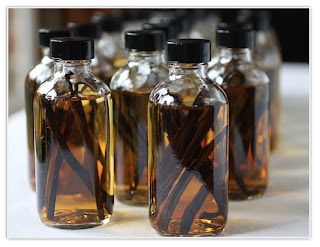 This post will introduce you to the different types of vanilla and the best use for them! NOTE: to use a vanilla bean properly, use a pairing knife to split the bean lengthwise in half and scrape out the seeds. If you are having trouble finding some of these varieties in a local grocery store, visit BEANILLA for all of your vanilla bean needs! Madagascar: A good vanilla for a a recipe that needs to be flambeed. The vanilla is dark, full bodied with flavour notes of rum. Bourbon: A great vanilla for cookies and cakes, as it adds dimension and complexity. Bourbon vanilla has a more fruity flavour. Mexican: A very sweet, creamy and smooth vanilla. Perfect for infusing milk, pastry creams, whipped cream, and ice creams. Tonga: A more delicate vanilla. Better for developing fruit sauces or to accompany meats, chicken or pork. This variety allows one to reminisce of cherries and autumn. Papua New Guinea: This vanilla has subtle notes of chocolate and red wine. This vanilla's flavour tends to disappear into the background of other prominent flavours, so use it more for delicate cakes or cookies. Tahitian: Floral with hints of liquorice and fig. A great vanilla to use when making james or preserves. 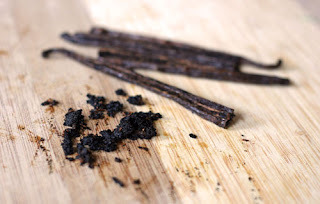 This vanilla is often used in making a "chai" spice mix or spice rubs that include vanilla. Indian: These vanilla beans are much larger than a typical vanilla ea, and are oily with a woodsy quality. This vanilla can stand up well to spices and compliments dishes that have other flavours such as cinnamon, rosemary, thyme or clove. Indonesia: Like the Indian beans, they are thick and oily. This bean is the largest and has more of a fermented scent like a prune, which makes them best for stewing fruit, making pies or compotes. Thanks to vanillagarlic.com for parts the helpful vanilla bean information.